The Mulitfaceted Diva: Open Road! There's been a lot crammed into this week. I feel like it's been an entire month long in just seven short days. Most of it I have no memory of, I really think I need to be checked for Alzheimer's, or maybe just cutting back on the benzos might help my short term memory. One really cool thing I do remember is that Wednesday I went to bike night at Four Corner's Saloon. Isabella was an eye catcher, she especially caught the eye of two reporters. They both wanted interviews, but being that she's a bit on the aloof side I had to do all the talking. It was fun, she was beautiful and the night was a success. Tomorrow she and I are taking a weekend ride out to Sister's, Oregon. It's going to be great! Mid 80's, sunshine and my girl and me on the open road! It'll be nice wind down time from this week. Back Sunday sometime, hoping the kids survive or at the very least don't burn my house down. Maybe I'll post a few pics this weekend, maybe I won't. We'll see what I get. Keep on bikin', Diva. Especially with your sistas. You can tell us on Monday. Just keep away from the big trucks. Stay safe, but have fun! I rekkon this means you got the new tire! Have a fun safe ride! Sounds fun! Plus now i know a celebrity, hope she doesnt get a big ego! For about .2 secs I thought "isabella" was your granddaughter lol talk about having alzheimer's there are days when I get half way to the bathroom and can't remember if I was coming or going. Have fun this weekend!! Relax and just enjoy. You definitely deserve it!! 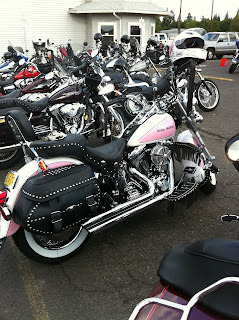 I am sure the reporters spied a pretty lady with a pretty bike and there go, famous!! Wish I could ride. It would be so much fun. The closest I get is a speed boat on the river. Thanks everyone. The ride was beautiful, but not good. Safe and sound though. I love Isabella! When my daughter was small, she use to say she wanted a purple motorcycle. Now that she's older and has been on the back of one, she's developed a fear of them. Wow... I clicked on the link for Sisters, Oregon.... it's looks beautiful! We haven't been to Oregon for a fun trip yet. We've been hitting the same places over and over lately. We love San Diego, Big Sur... etc etc. 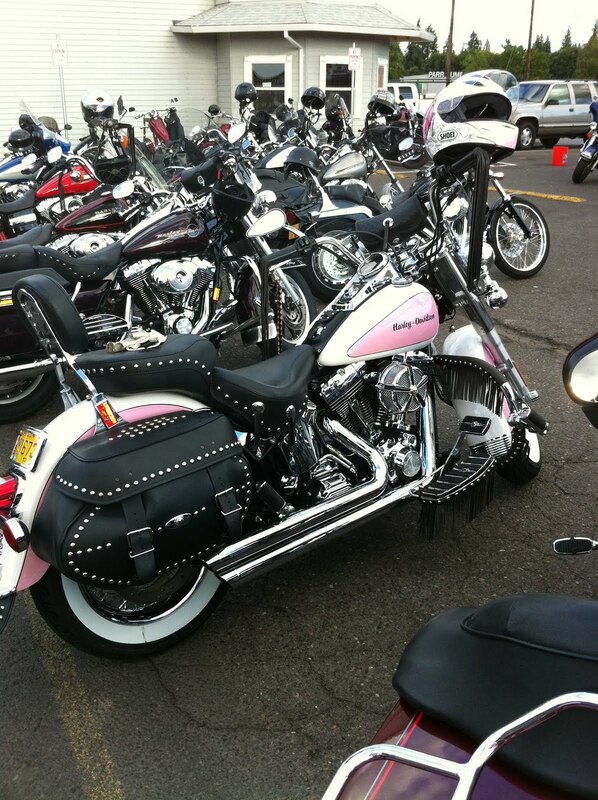 You have pink on your motorcycle! Ok, I have got to get me one of those too!...ok, not really, I'm a big chicken, but man! Pink! Seriously! I love that!